Chambers USA has called Bill "a towering figure in the commercial litigation arena," "brilliantly strategic," and "creative in thinking outside the box." He has been honored in every edition of Chambers USA since its founding. 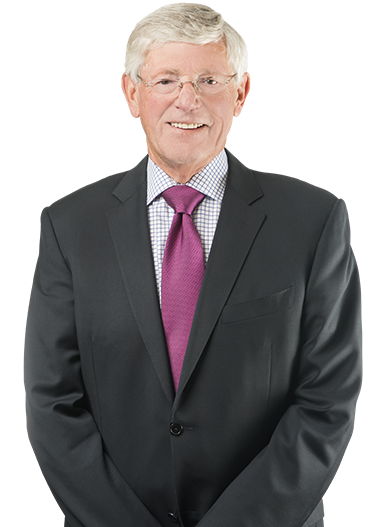 Bill has been named one of the Top 100 Trial Lawyers in America by Benchmark Litigation (2016 - 2018). “A superb generalist. You name it and he's probably tried it." Bill was featured in the cover story of Pennsylvania Super Lawyers Magazine in 2012. William T. Hangley is one of America’s most highly decorated trial lawyers and counselors. His practice involves representations of both plaintiffs and defendants. He has tried (not just litigated) First Amendment, antitrust, patent, estates, real estate, franchise, construction, employment, unfair competition, securities, civil rights, attorney malpractice, capital punishment, and general contract and business tort cases. Benchmark Litigation names Bill one of the top 100 lawyers in the United States; Best Lawyers has named him Lawyer of the Year for “Bet the Company” litigation. Chambers USA has never left him off its list of “Band One” Commercial Trial Lawyers. He has several times been a top-three vote getter in the annual Pennsylvania Super Lawyers rankings, and was recently the on the cover of its annual magazine. A longtime Fellow of the American College of Trial Lawyers, he has served as the College’s Regent for Pennsylvania, New Jersey, and Delaware. He recently completed a six-year tour as a member of the United States Judicial Conference Advisory Committee on Evidence Rules (by appointment of Chief Justice John Roberts), and is currently the Liaison of the ABA Section of Litigation to the Advisory Committee on Civil Rules. He has been a member and then Chair of the Pennsylvania IOLTA Board (by appointment of Pennsylvania Chief Justice Ronald Castille), and served as Chair of the Third Circuit Lawyers Advisory Committee (by appointment of Third Circuit Chief Judge Anthony Scirica). He has been Co-Chair of the ABA Section of Litigation’s Federal Practice Task Force and a member of the Task Force on Discovery and Civil Justice, a joint project of the American College and the Institute for the Advancement of the American Legal System, which works to address the increasing inefficiency and expense of the civil justice system and the disappearance of the civil jury trial. During the 1990s, Bill presided over jury trials as a Judge Pro Tem of the Philadelphia Court of Common Pleas, helping the Court address its then-critical case backlog. He currently serves as a Special Discovery Master for district judges in two ongoing complex civil litigations. Beginning with its first edition, Chambers USA: America’s Leading Lawyers for Business has named Bill as one of five or six Band One Commercial Trial Lawyers in Pennsylvania. He has been consistently recognized by The Best Lawyers in America as one of a handful of “Bet Your Company” Pennsylvania trial lawyers, and was recognized as the 2010 Philadelphia Lawyer of the Year for Bet-the-Company Litigation.